Simon Callow returns to the West End this Christmas to star in his critically-acclaimed, one-man production of Charles Dickens’ A Christmas Carol. Last seen in London in 2012, the festive frolic is based on Dickens’ own performance of his novel in 1853 and 1869. Playing at the Arts Theatre for a strictly limited seasonal run, A Christmas Carol opens December 15th, with previews beginning December 8th. Based on the well-known Dickens novel, A Christmas Carol is the beloved story of Ebenezer Scrooge, a miserly old man who is convinced that Christmas is the worst time of year. On Christmas Eve, Scrooge is visited by the ghostly spirits from his past, present and future, who force him to face his worst fears and change his ways forever. A treasured story of celebration, joy and redemption, this is a festive treat that promises to warm the heart of the most Grinch-like audience member. 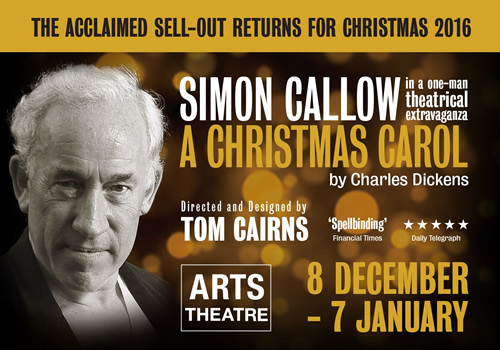 Simon Callow stars in this one-man extravaganza, having previously starred in Charles Dickens in The Mystery of Charles Dickens at the Playhouse Theatre. An acclaimed British actor, Callow has extensive credits, both on stage and off. Notable productions include Waiting for Godot, alongside Ian McKellen and Patrick Stewart, Being Shakespeare and Dr Marigold & Mr Chops. Screen credits include Doctor Who, The Woman in White and many more. Directed by Tom Cairns, this reimagining of the classic Christmassy tale is designed by Cairns, with sound design by Ben and Max Ringham. A heart-warming, festive story, A Christmas Carol with Simon Callow opens at the Arts Theatre London on December 15th and runs until January 7th 2017, with previews beginning December 8th 2016. A Christmas Carol is a festive treat suitable for ages 8-88!